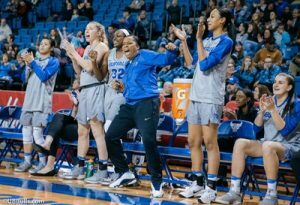 The Buffalo Bulls Women’s Basketball Program is finding success at the highest level under Head Coach Felisha Legette-Jack. With a current MAC leading RPI of #20 and most recently, receiving votes in the USA Top 25 Coaches Poll – it’s safe to say that 5’7.5’’ is a little number -deceiving in a big way. That’s the average height of the deadliest backcourt in the Mid American Conference; and looking at national statistics, arguably one of the most electrifying in the country. 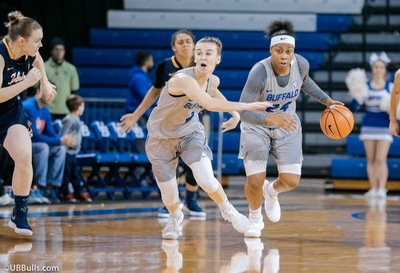 Not measurable is the amount of energy and effort on display from the dynamic duo of Buffalo Bulls senior Stephanie Reid and junior transfer Cierra Dillard. Reid is coming off a career milestone. Saturday, in front of her home Alumni Arena crowd, she was a major contributor in her team’s 87-69 win over the defending MAC Champs in Toledo. Reid posted 10 assists, giving a grand total of 577 in her career of 99 games. That made her the all-time assist leader in Bulls program history. She is currently ranked 5th in the country dropping an average of 7.6 dimes per game. What fans may not remember is that Reid started her freshman year in late December. She arrived to Buffalo, by way of Australia, during the short Christmas break – had about a week to learn the Buffalo system and has started almost every college game since. If you take half a season away from that first year, and notice that there is just a short half a season remaining this year- Steph Reid achieved this record almost an entire season shorter then the usual allotted four. This is staggering to think about, and yes, while you need teammates to make buckets for an assist to exist- she is a true floor general, always one step ahead of her opponents and sometimes even her own teammates. Reid’s impeccable court vision, quick hands and fiery style lead to exciting hoops. Rochester native Cierra Dillard made an immediate impact last season as a Bull when she, due to her transfer from UMass, had to take a redshirt year. However, “sitting out” would be poor word choice. Dillard brought an unmatched high level of energy on the bench, often photographed with two feet well off the ground. It certainly kept the Buffalo fan base intrigued- how would this transpire onto the hardwood? Fast forward to this year and CD is having a season that she, nor any of those paying attention to the program, will likely forget for a long time. Dillard is the current and two-time consecutive MAC East Player of the week. This week, she is 13th overall in the country, averaging 3.2 steals per contest. However, it’s not just the takeaway that gets the lucky audience on their feet. Lately those steals have been leading to outrageous no-look passes or a push-up to Reid, back to Dillard for a transition three that many times, ends up getting released in front of her own- or visiting bench. This type of play is why Dillard is on the Women’s Basketball NCAA Player of the Week watch list. Felisha Legette-Jack and her staff are boisterous, passionate and high energy. These characteristics are seeping directly onto the court. It without a doubt starts with the intangible energy and leadership of Reid and Dillard. Whether coming across the Pacific Ocean from Melbourne, Australia or a short trip and a couple of tolls via the I-90 from Rochester, make no mistake, two young women have found a place to forever call home. Buffalo will host Eastern Michigan ( 5-3 MAC ) this Saturday. The Eagles are also led by a dynamic JR transfer (Syracuse) guard in Danielle Minott, who like Dillard (EAST), is the reigning MAC (WEST) Player of the Week. Tip is set for 2.